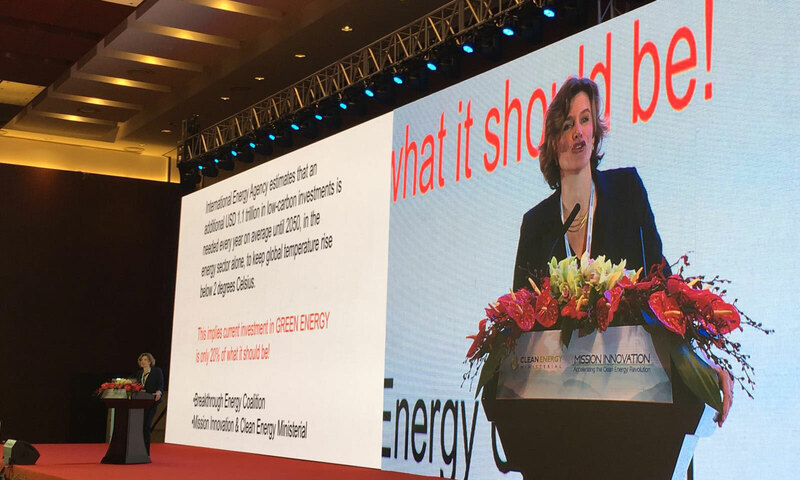 Professor Mariana Mazzucato gave a series of talks at the second Mission Innovation-Clean Energy Ministerial conference in Beijing, China, 6 – 8 June 2017. The conference brought together two groups that were formed after the 2015 COPS meeting in Paris: Mission Innovation and the Clean Energy Ministerial (CEM). While MI focuses on breakthrough R&D for the new technologies of tomorrow, the Clean Energy Ministerial (CEM) focuses on scaling the deployment of technologies and solutions that are available today. Together, MI and CEM aim to be a robust platform for accelerating clean energy innovation and facilitating its uptake by a global market. The meeting was attended by senior Ministerial delegates from 22 member nations and the European Union—representing more than 80% of the world’s public investment in clean energy research. Mazzucato’s lunchtime keynote on June 7th was a session organized by both groups. Her talk,“Green growth: Rethinking public and private risk-taking”, was delivered to an audience of global Energy Ministers from 22 countries and leading figures from the finance and energy sectors. Mazzucato also moderated the opening panel discussion on the important roles of Mission Innovation & the Clean Energy Ministerial in driving progress in the energy revolution (8th June). The panel included: Bertrand Piccard, Solar Adventurer, Solar Impulse; Bjorn Otto Sverdrup, Senior Vice President for Sustainability, Statoil; Wu Gang, Chairman, Goldwind Science & Technology; Rachel Kyte, Chief Executive Officer, Sustainable Energy for All (SEforALL); Ibrahim Baylan, Minister, Ministry of the Environment and Energy, Sweden; and Riku Huttunen DG of Finland’s Dept of Energy. Mazzucato also met with US Energy Secretary Rick Perry, with whom she discussed the key role of the state in driving clean energy innovation as set out in her book, The Entrepreneurial State: debunking public vs. private sector myths. Earlier in the week she spoke at an event hosted by the Energy Foundation on why a green revolution needs a mission-oriented public sector and a definancialised private sector (6th June). The green economy and sustainable development, will be a key area of work for the new Institute for Innovation and Public Purpose that Prof. Mazzucato is directing at UCL. IIPP research in this area focusses on the relationship between the sources of finance and the direction of innovation, as well as the role that mission-oriented investments can play in aligning upstream and downstream investments. This strand will be developed in collaboration with Visiting Research Associate, Dr Gregor Seminiuk.